As you learned in a previous article on Cinnamon and Mate elsewhere in this issue, the Mate desktop began life as a fork of Gnome 2. Now that the Gnome project has ceased to develop the official Gnome 2 codebase – and has moved on to the controversial Gnome 3 – users and developers who prefer the Gnome 2 environment have turned their attention to the Mate alternative. The most popular pre-installed Mate distro is the Mint Linux Mate edition; however, Mate is starting to pop up in other places around the Linux universe. One exciting development for Free Software followers is a new Debian-based Linux alternative with the Mate desktop. DMDc (Debian Mate Desktop Cosillas)  boots to a convenient Mate desktop and integrates the vast Debian archive with some smart and useful original applications. After selecting the appropriate language from the Grub menu, the Live DMDc boots to a graphical desktop. In our lab, we were able to boot to systems with low-performance Intel graphics cards without any problems. The DMDc desktop is anything but spartan. On the right side, you will find the vertical digital Rainlendar calendar (see Figure 1); the developers supplement the horizontal panel at the top of the screen with a vertical ADeskBar integrated on the left . This application panel uses much smaller icons than its counterparts from Unity and Gnome 3. Thus, the panel is not only visually less obtrusive but has space for far more starters. 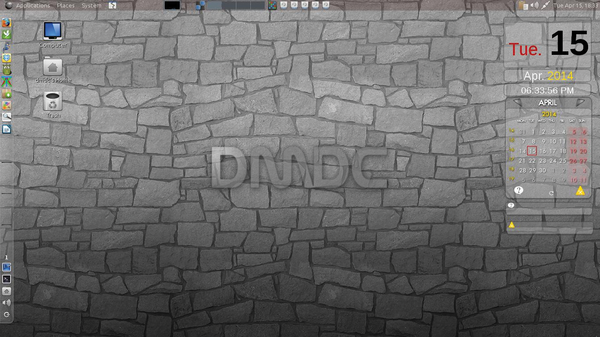 Figure 1: First look at the DMDc desktop. On the desktop itself, you will find the familiar icons Home, Computer, and Trash, along with another icon for installing the system. The installation icon takes you to a routine that lets you partition the mass storage devices in a few steps, create user accounts, and choose your locale. Then, the installer dumps about 1,800 packages amounting to 4.4GB onto your disk. After a swift reboot – even on not-quite-so-new computers with dual-core processors – the system, which is offered exclusively as a 64-bit variant, comes alive with a huge variety of software. You can control the Mate desktop exactly as you can with the legacy Gnome 2; however, the developers have replaced some applications from the Gnome back catalog with completely unknown programs. The ADeskBar at the top comes with a number of pre-docked applications, and some buttons live down at the bottom for launching the file manager and a terminal. The horizontal panel at the top of the screen features a system tray on the right and three menus (Applications, Places, and System) on the left. You will also find several containers with icons that let you mount and unmount partitions and drives, as well as a pager for switching between desktops and a small display that provides information on the system load. In spite of its "old world" visuals, the most recent DMDc desktop at the time of publication comes with cutting-edge software under the hood: In addition to the 3.13-1 kernel, Mate 1.8, and version 1.4.8 of the MDM Display Manager, DMDc provides full support for Compiz and the Emerald window decorator. In addition to well-known software heavyweights, DMDc also comes with a whole host of virtually unknown applications that focus strongly on social networking and online services. 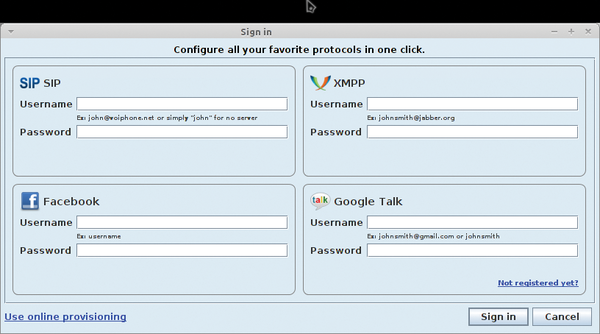 The relatively unknown Jitsi , for example, enables video communication using various standardized protocols and services within a single interface (Figure 2). Figure 2: Jitsi enables video conferencing over different channels. The client for the Dropbox cloud service is launched, like Jitsi, by clicking on the icon in ADeskBar on the left. Also in the panel is Tixati , a Bittorrent software tool that offers functionality similar to the conventional Torrent clients in a pretty interface. The submenus contain more exotic treats. In particular, the developers have stashed a number of interesting applications under the Internet and Multimedia headers. These apps include GrooveOff  and gSharkDown , two audio players that search for freely available music on the Grooveshark Free music site , copy it to your hard disk as needed, and play the files offline. The Internet menu features numerous applications for using online services, as well as the WiFi Guard  utility. WiFi Guard lets you automatically identify intruders on your wireless home network through regular, automated scans (Figure 3). Figure 3: WiFi Guard puts an end to unauthorized infiltration of WiFi networks. In the System Tools menu, DMDc offers some tools from both the Debian and Mate portfolios, as well as some in-house developments, to help you manage USB media and remove any system kernels you do not need. AQEMU, an emulator that builds a bridge to non-native platforms, is also on board. JDiskReport  quickly visualizes your current media usage, which helps you identify disk hogs in case you're having problems with storage space (Figure 4). Figure 4: JDiskReport helps you keep track of hard drive utilization. Popular desktop environment continues the Gnome 2 legacy – with new support for the Gnome 3 toolkit.